Since the beginning of time, humankind has drawn on animals to depict the ethical values of each culture, making use of their image to proclaim the defence or disapproval of those values. This animal imagery has largely been lost in postmodern culture. Nowadays, the portrayal of animals is more associated with ecological awareness, wildlife conservation and animal rights than with their symbolism of the spiritual essence that human beings ascribe to them. The media of our time abound with documentary photos of wild animals, taken from Jeeps, conveying the precarious nature of their existence; beings which today can virtually only be found on African reserves. In this day and age, the adventurous artist is willing to spend a fortune travelling, just to document the beauty of the wild animals, usually in black and white, for greater nostalgia and dramatic effect. Hence, the practice of drawing on the basis of descriptions given by world travellers is now a thing of the past. Perhaps the most meaningful portrait or at least one of the most widely studied illustrations is that of the rhinoceros produced by the German Renaissance artist Dürer. This master painter, who never saw the actual animal himself, drew it based on the descriptions that he had received. 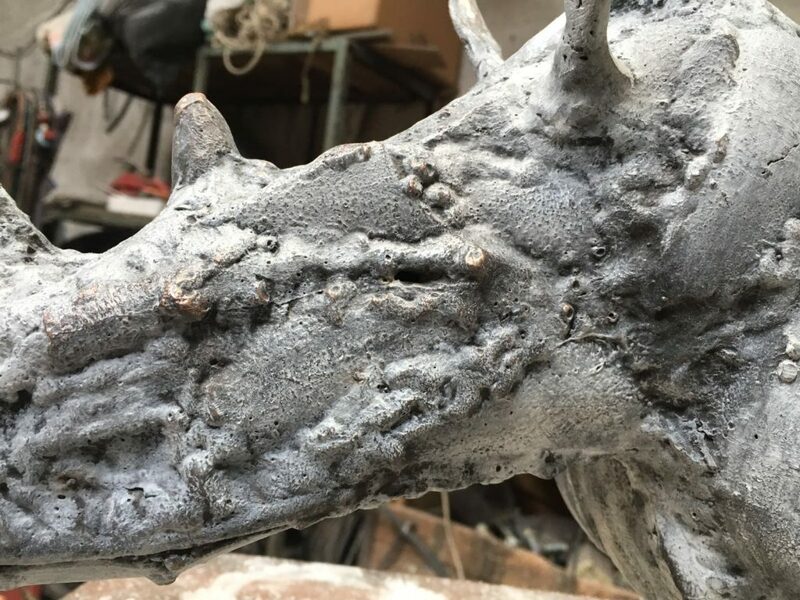 Nearly all of those reported sightings spoke of an armoured or scaled animal, ascribing to the rhino the qualities of physical strength, as well as spiritual fortitude and purity. This creature, which is mythical in itself, symbolises strength, courage, harmony and fertility. 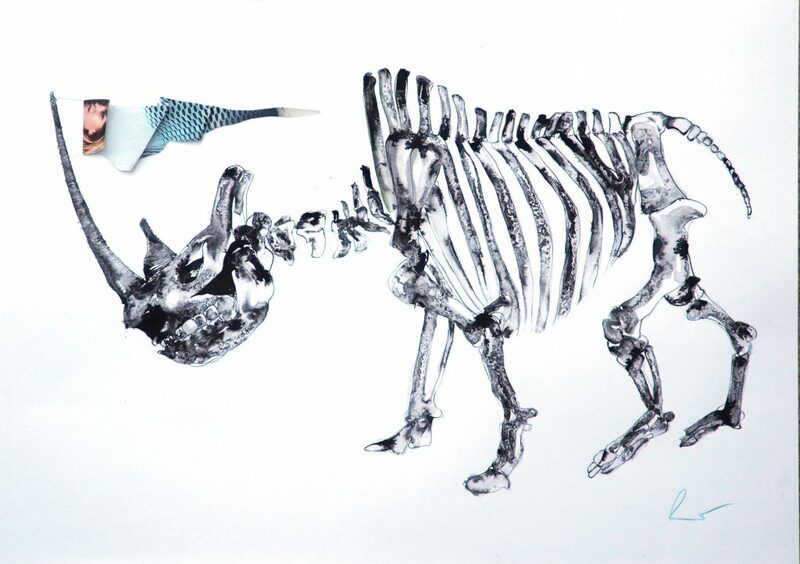 No other member of the wildlife kingdom embodies higher ethical values than the rhino. Oddly enough, the depiction of this animal dressed in armour would prevail for centuries, even after the rhinoceros was imported to Europe. After all, in the physical act of viewing things, the brain and the preconceived idea are the underpinnings of our recognition of what it is that we are observing. For centuries, the act of ascribing human moral qualities to animals has enabled rather bold descriptions of human behaviour. 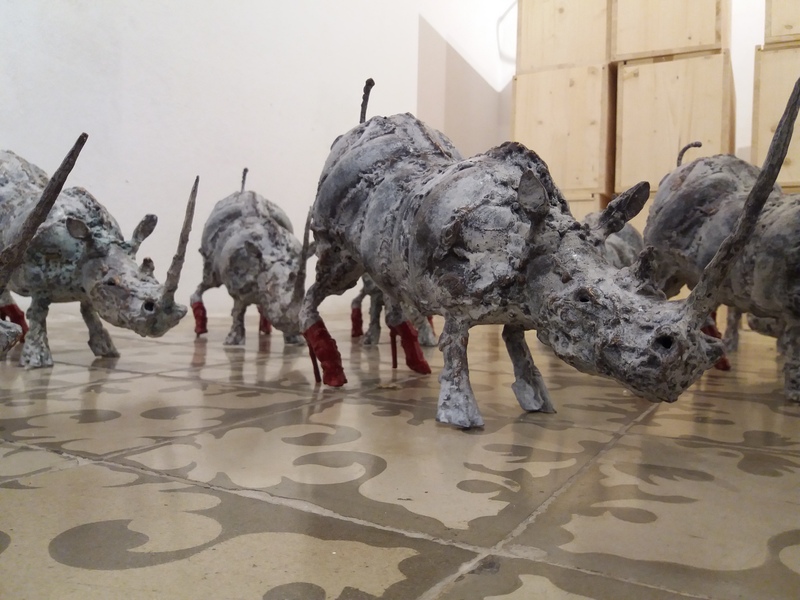 Through his project titled “Rinoceronte” [“Rhinoceros”], Rogelio Olmedo recovers the narrative genre of the fable to illustrate human nature using zoomorphic men, with an almost bewildering natural sincerity. 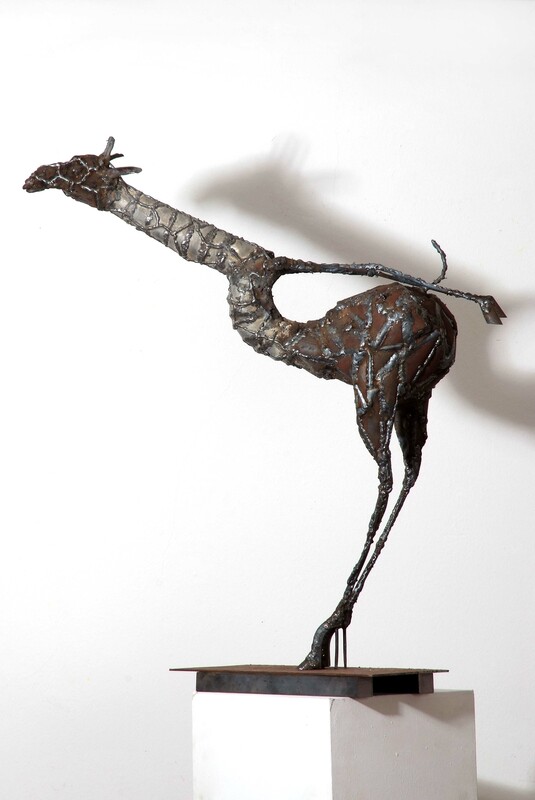 Above all, Olmedo makes use of studies for a series of iron sculptures and inks on paper that faithfully reproduce humanised wild animals. Particularly remarkable is the mastery of his metal lines in the air; strokes undoubtedly inspired by the synthesis characterised by comic strip drawings. For years, critics have condemned these sorts of realist portrayals, labelling them uncultured and reactionary. Nevertheless, the artist recovers the only genre that has survived the supremacy of the Hegelian spirit to this day: the caricature, which was initially justified by Goya’s Caprichos and the theories of Baudelaire. The artist’s perception of the creatures and his resulting description presupposes a selection of themes that describe our own animal nature. 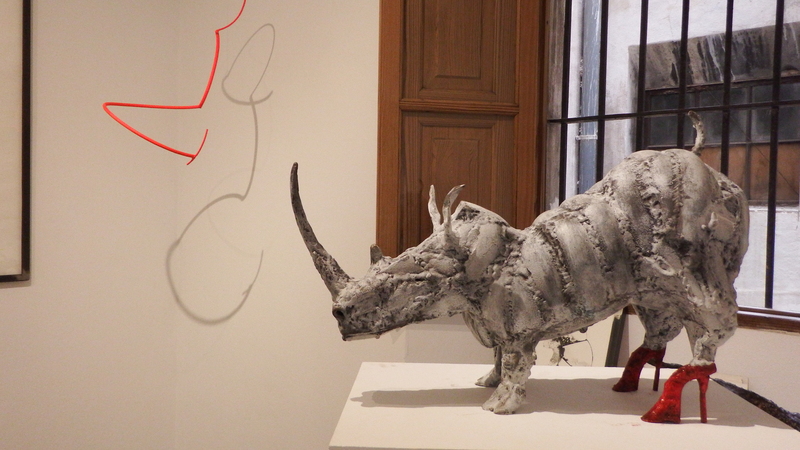 Through his sculptures “Rinoceronte de incógnito” [“Rhinoceros Incognito”], “Jirafa. Adoro Mis Manolos” [“Giraffe: I Just Adore My Manolo Heels”] and “Mono Con Manoletes” [“Monkey with Manolo Heels”], Olmedo presents us a clear and almost naïve discourse. Humour is intrinsic to the concept. 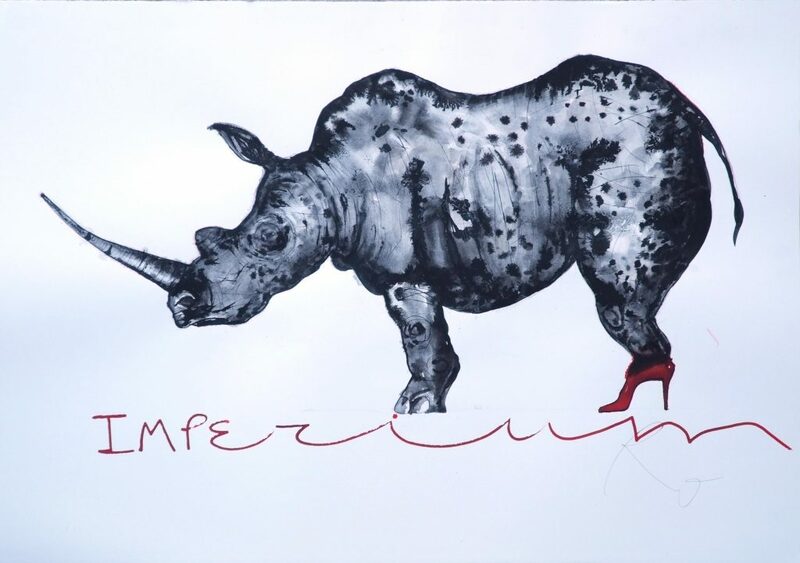 The idea alone of a rhino in high heels is sure to make us smile. 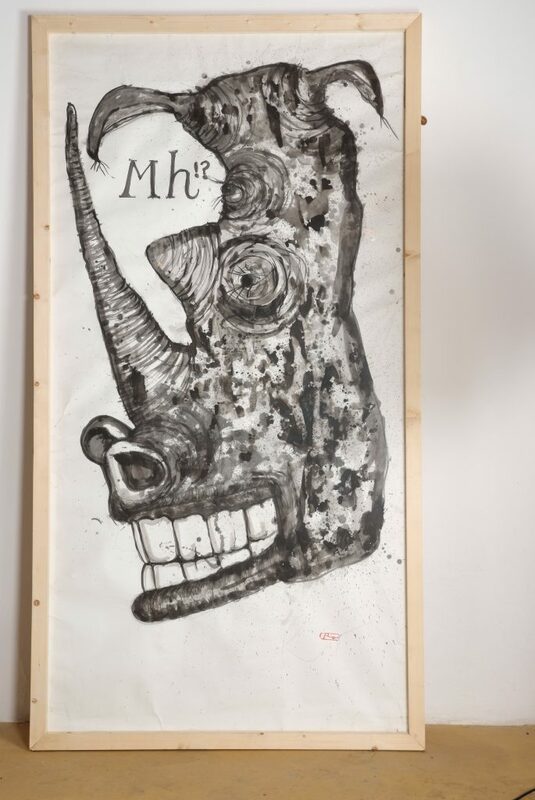 The artist has chosen the animal with the finest ethical pedigree in history to create a caricature that becomes grotesque at times, with an exhibit that serves as a sort of mirror for the viewer and as a reflection of our society. 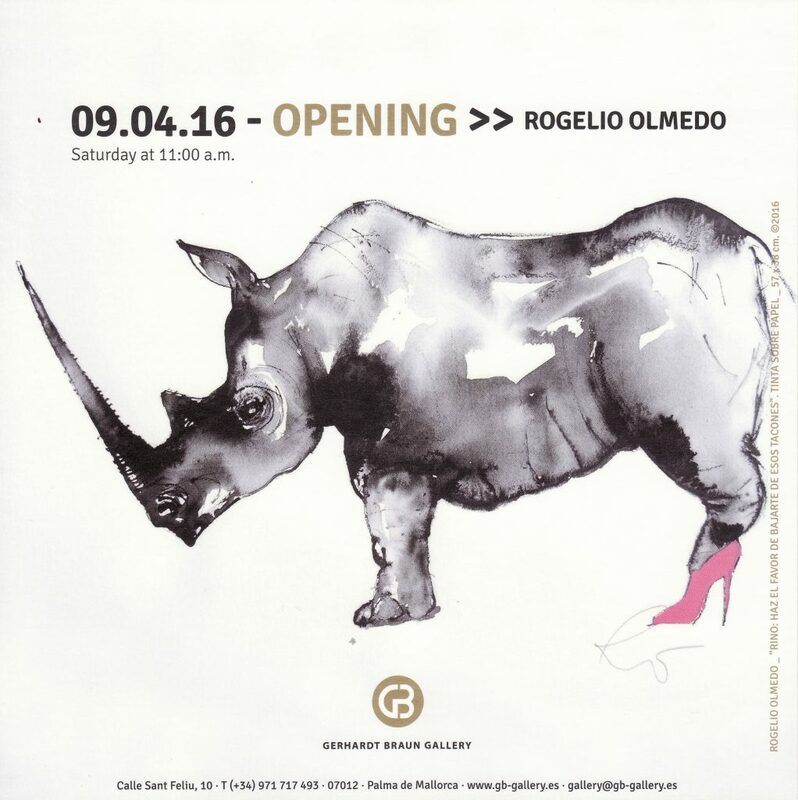 Rogelio Olmedo’s career in the arts began in the world of design and land art, as can be seen in the fresh boldness of a discourse that, far from being simple, invites us to reflect on the absurdity of many of contemporary society’s most prevalent values. 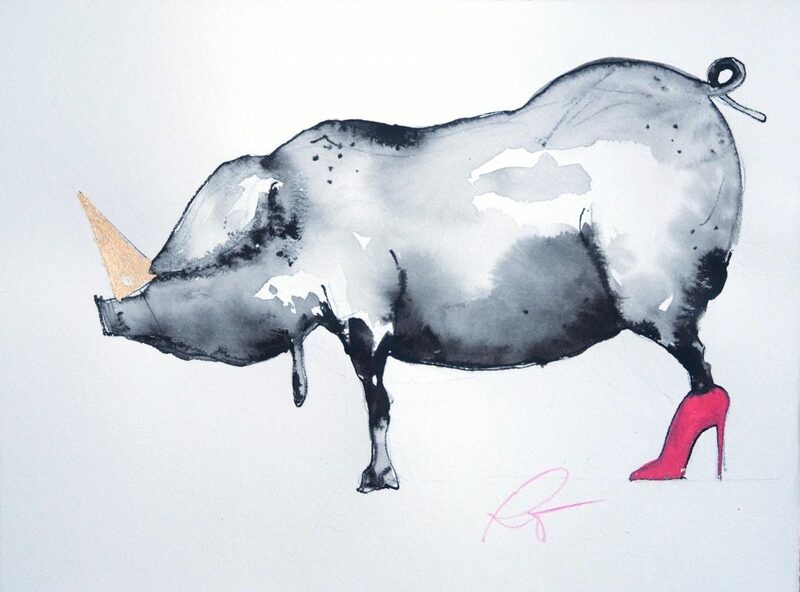 To do so, he draws on an icon from fashion’s pop culture, the high heels of Spanish designer Manolo Blahnik, to portray a two-ton animal that has voluntarily subjected itself to the constraints of the shoes, and to create the irreverent punk aesthetics that come through in his more grotesque drawings, such as “Rino con Diente de Oro” [“Rhino with a Gold Tooth”], and “Cráneo de Jirafa con Oro” [“Giraffe Skull with Gold”]. 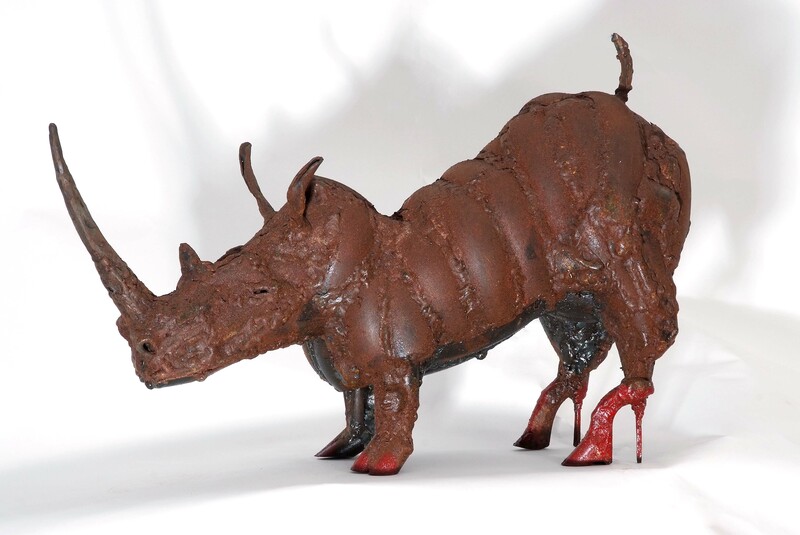 In a fit of madness, standing on high heels, the animal falls victim to its own vanity, losing every trace of dignity. The other animals attempt to imitate it and compete for the limelight. The ink drawings that accompany these sculptures reinforce the notion of contrived appearances taken to extremes. 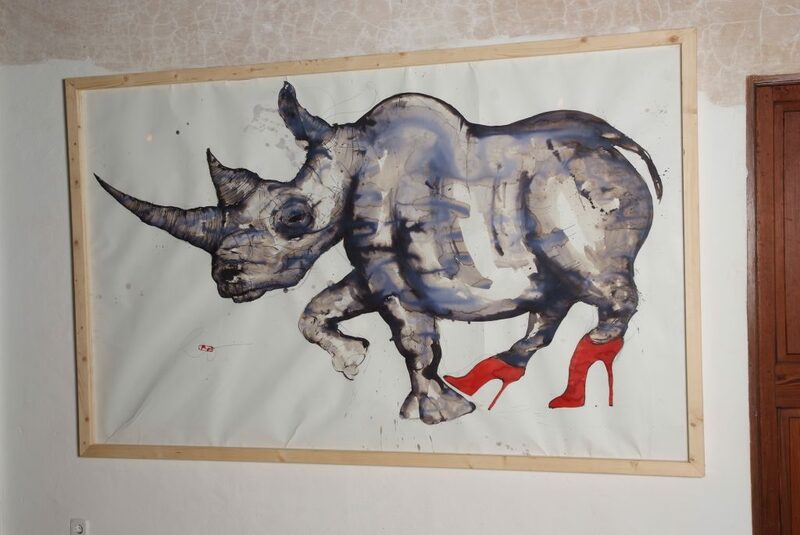 Among them is the “Aspirante A Rino Sobre Manolos” [“Wannabe Rhino on Manolo Heels”], which portrays a pig disguised as a rhinoceros wearing high heels. In a way, this caricaturesque fable evokes the story of “The Emperor’s New Clothes”. Here we are faced with the description of a society that is increasingly more concerned with what it has and with what it looks like than with what it is actually doing. The type of society portrayed could never serve as a source of pride: a society void of principles that has been taken over by superficiality, where no importance is placed on exploring thought or ideas. In a society like this, vanity and envy are certainly the most widespread human flaws; flaws that clearly and inevitably lead to mindless sheep-like behaviour, foolish imitation and therefore to being easily manipulated by those whose interests have nothing at all to do with the common good. 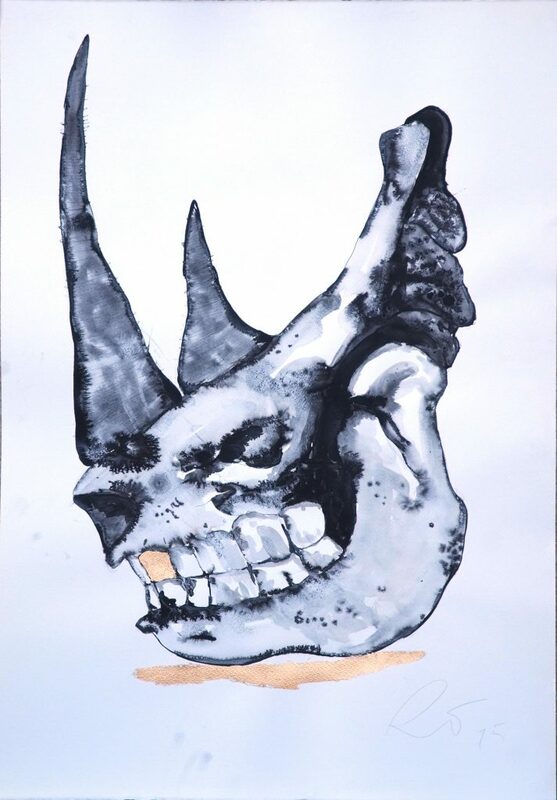 All the values portrayed by Dürer’s Rhinoceros are therefore shattered by the mockery made of the animal. Olmedo does not tell us how the tale begins or how it will end. Nor is there any moral to his story. He simply shares his findings. 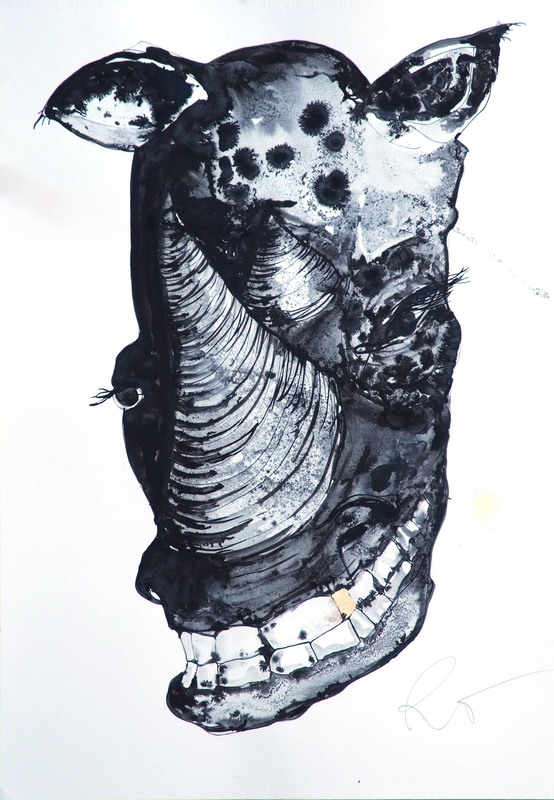 Nevertheless, the massive ink drawings – psychological portrayals of the central figure, where the grotesque stands out for both its size and its shape – and the sculpture “Esqueleto de Rinoceronte” [Rhinoceros Skeleton], as well as his many drawings of skulls, lead us to foresee the ill-fate of a society that is sustained on mistaken values, while emphasising that a lack of principles will bring about a loss of freedom. The ongoing imitation of bony figures with tags will always inevitably be a latent risk.